Each time a Rockies home run ball hits any part of the 'Hit the Mitt' sign in left field this year, UCHealth will donate $5,000 to the Leukemia & Lymphoma Society. 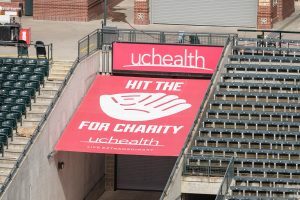 UCHealth’s large red and white “Hit the Mitt” sign at Coors Field is back this baseball season with a new beneficiary for the left field home run challenge: The Leukemia & Lymphoma Society Rocky Mountain Chapter. Every time Rockies players slam home runs that hit this “Hit the Mitt” sign at Coors Field, The Leukemia & Lymphoma Society will get $5,000. Each time a Rockies home run ball hits any part of the UCHealth “Hit the Mitt” sign in left field throughout the 2019 season, UCHealth will make a donation to the Rocky Mounatain Chapter of the Leukemia & Lymphoma Society (LLS). The non-profit funds cutting-edge research to advance cures for leukemia, lymphoma, Hodgkin’s disease and myeloma. “We’re thrilled to bring back this challenge in its second year to see how many times the Colorado Rockies will homer out to the ‘Hit the Mitt’ sign,” said Manny Rodriguez, chief marketing and experience officer for UCHealth. LLS is the world’s largest voluntary health agency dedicated to blood cancer. Its mission is to cure blood cancers and improve the quality of life of patients and their families. “Cassie is a great example of the resilient patients we see, and we are honored that UCHealth has chosen LLS to raise money for research to one day cure blood cancers,” said Beth Muehlethaler, executive director for LLS, Rocky Mountain Chapter. “Hit the Mitt” is one of many ways UCHealth partners with the Colorado Rockies throughout the baseball season to connect with our communities. A number of events and activities are programmed every season to encourage fans to “Rock Your Routine,” inspiring all Rockies fans that healthy habits can pay off over time. Jessica Berry is a media relations specialist for UCHealth in metro Denver and can be reached at 303.807.9491 or via email.